Projects are undertaken for various reasons. Each project should have clear justification and methods defined to show its ‘worth’ taking it. Strategic goals of organization, Market Need, Technological Advancement, Competitive Advantage, Profitability, Project/Portfolio Management Office (PMO), Sponsors are key in project selection. Below I presented the gist of few widely-used project selection methods. Decisions are made based on the best information in hand about a particular project at a given point of time. 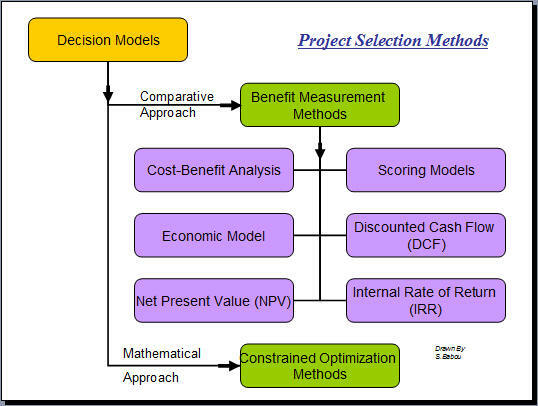 One can use either Benefit Measurement Methods(Comparative approach) or Constrained Optimization Methods (Mathematical approach) or both to arrive conclusion on project selection.Out of these two benefit measurement method is most commonly used. Benefit measurement methods are based on measuring the benefits in taking up the project and comparing the results against other projects or a strategy benchmark. Cost-Benefit Analysis, Scoring Models, Economic Models, Discounted Cash Flow(DCF), Net Present Value (NPV), Internal Rate of Return are different types under Benefit measurement methods. Constrained optimization methods uses complex mathematical calculation based on different worst/best case scenarios and probability of outcome and then selecting project on best results. Generally known methods are Linear programming, nonlinear programming, multi objective programming. Let me explain about each of these methods in brief in a later post. 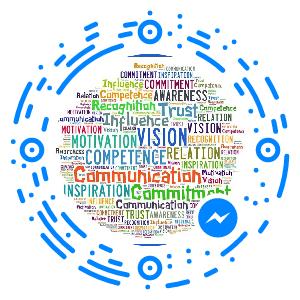 This entry was posted in Framework, Project Management and tagged Framework, Project Management, Project Management Framework, Project Selection Methods. Bookmark the permalink. Dear mr babou, I, Amaugo Obinna wants to appreciate you, because your article on project selection has helped me a lot on my assignment, please do update me more on your articles, and more grease to your elbow. the purpose of tests in the projects? hello sir,Its ASMAT there,i read your article and it is so nice to know about prject selection,more over if possible please let explain the mathematical calculation of each. Project management i was thinking to be easy one but after mathematical calculations of CPM and backward,forward pass methods i made me to say it needs great deal of analysis and assessment. Dear Mr. Babou, you have provided a real comprehensive information in one message. I am recently doing Masters in Business Administration, my research study topic is “project selection techniques as a critical success factor”. you are requested to allow me to use your above explained model and guide me to go further if you like. Please also refer me related articles and websites. I am really happy to get a mail from you. You can use my blog post for your research project. I prepared few writeup about each of the project selection methods, but i haven’t posted them yet. For your benefit, I will surely post them before mid of July 2010.